Everyone knows America’s passenger train system is pathetic by international standards, so President Obama’s $13 billion commitment to build a national high-speed rail network has come as a wonderful surprise. It also raises the question of whether a reinvigorated rail industry could, with the car industry and several airlines drifting into bankruptcy, be the next great hope for keeping people employed in this country? Though the U.S. is the world’s largest economy, the market for passenger rail vehicles and services has shrunk dramatically over the past several decades. European and Asian countries have invested heavily in expanding their rail offerings but Washington has done little more than keep national operator Amtrak on life support. As a result, rail accounts for only 0.3% of total transportation usage in the U.S., compared to 6% in the U.K., 10% in Austria, and 27% in Japan. Because of the lack of adequate train services, automobiles and airplanes provide the only medium-to-long distance commuting choice for the majority of Americans. This has meant that US companies have largely missed out on participating in a major global industry. The competitive market for rail manufacturing and services in Europe accounted for more than 20 billion euros in 2005. The market in the Nafta zone of the U.S., Canada, and Mexico was only one-quarter as large, even though the two areas have equivalent populations. There has been some increased recent investment in urban rail networks in the US: there are several foreign factories that make vehicles for commuter and light rail systems in stateside facilities. But there are no plants making intercity trains, as Amtrak hasn’t ordered new rolling stock in a decade and no passenger rail manufacturers are headquartered in America. In the world passenger rail market, three companies currently dominate: the Canadian Bombardier, the French Alstom, and the German Siemens. In Germany, railway manufacturers collectively employ 45,000 individuals who produce new trainsets for large markets in that nation and abroad. Bombardier alone provides jobs for 34,000 people in the rail industry. But none of these companies employs the mammoth 200,000-plus person workforce of a major auto company like Ford or GM. Even in fully-developed rail markets such as those in Europe, train production doesn’t create as many jobs as making cars. Yet rail vehicles, unlike automobiles, need a staff to operate them, and that’s where a passenger rail industry could prove its value in creating new jobs. France’s TGV high-speed trains, which criss-cross that country, carried 100 million people in 2008, and the national rail company employs about 200,000 people (that number includes people working on commuter trains). France is 1/5th the size of the U.S. in population. One can extrapolate: an equivalent American rail network could transport 500 million passengers a year on fast rail and provide jobs for one million people operating trains, maintaining track, and serving customers. 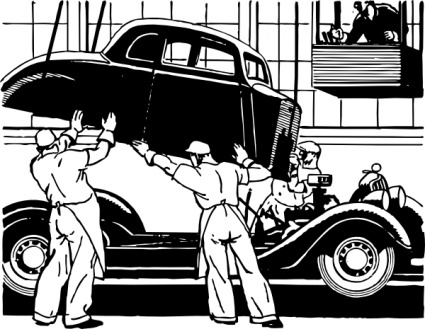 There are about as many people working in motor vehicle and part manufacturing in the U.S. today. A vibrant rail industry would mostly be a service-oriented one, rather than a manufacturing one. The U.S. isn’t close to providing anything of the sort today: Amtrak’s 18,000 employees served only 29 million passengers in 2008. It’s hard to imagine an $8 billion dollar investment from Washington being enough to stimulate the 20-fold expansion of a transportation sector, but it’s a start. Perhaps America should look for an example in its success in transporting freight by rail. Since 1980, the railroad industry has invested $420 billion of its own funds for locomotives, rail cars, tracks, bridges, and tunnels, and today freight companies like CSX and Norfolk Southern manage more than 140,000 miles of track and transport more goods than do truckers. More than 180,000 people work in the field. There’s no reason equivalent success couldn’t arise from a passenger rail industry. Yonah Freemark is an independent researcher currently working in France on comparative urban development as part of a Gordon Grand Fellowship from Yale University, from which he graduated in May 2008 with a BA in architecture. He writes about transportation and land use issues for The Transport Politic and The Infrastructurist.